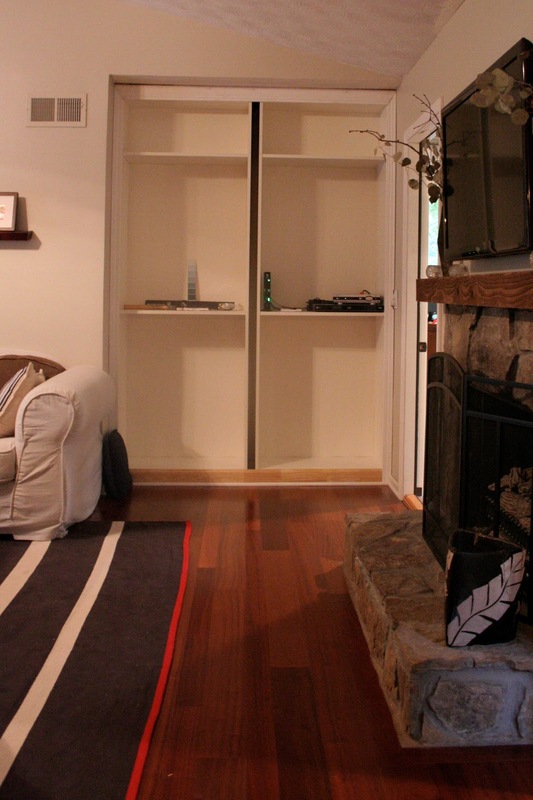 The bookcases are finished! We're still tweaking the overall arrangement...but it's a bookshelf, it's meant to be in constant motion as a matter of principle. 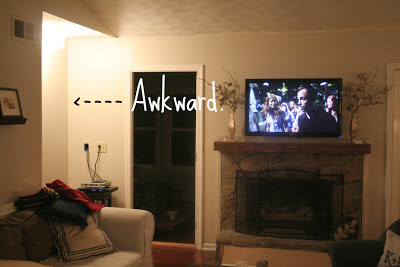 We started with this strange little alcove in the corner of the living room. I have no idea what its intended purpose was in 1979. When we bought the house it was a wet bar, which we found out was a DIY job probably done in the early 80s. 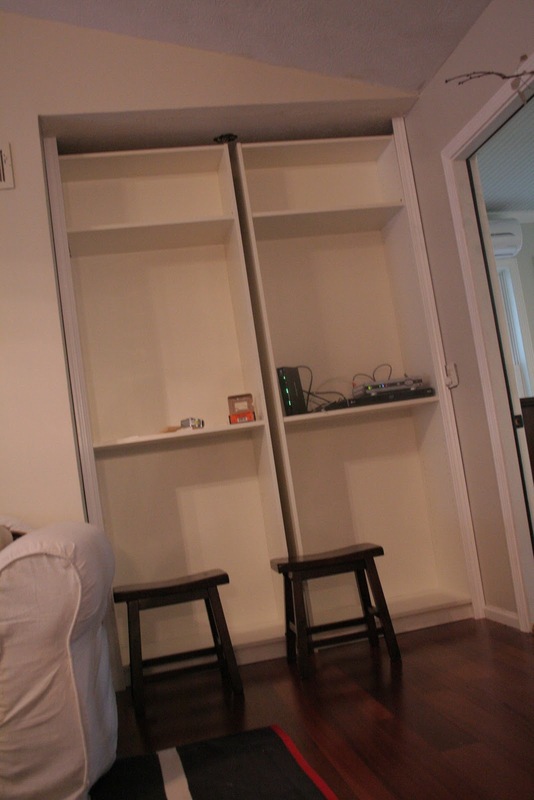 Within a few months of moving in we ripped out the wet bar and shoved a console in the space to hold our 29" rockin' tube TV. When Uncle Tonny came to demolish our fireplace and put in the doors leading out to the porch (now playroom) he removed the molding and extra drywall that had been installed by the wet bar folks. 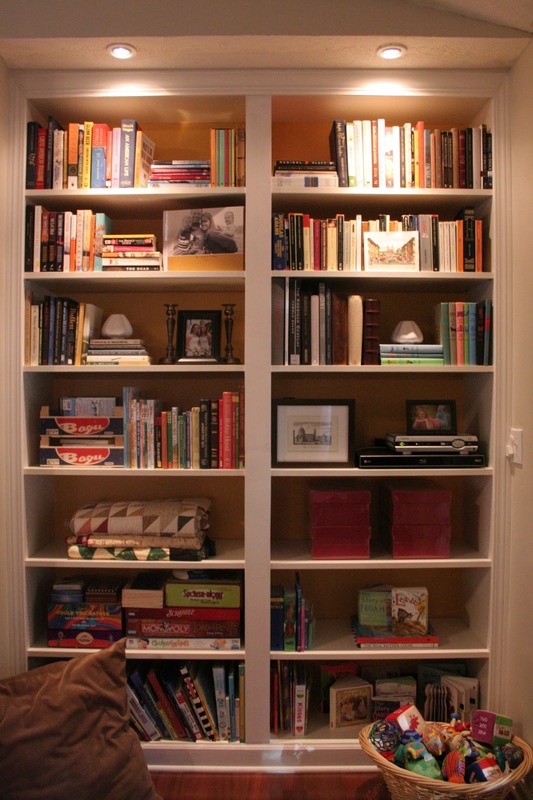 We immediately realized that bookcases would be a perfect use for the space. Trouble is, we did the playroom first and found ourselves out of money for unnecessary aesthetic house renovations yet again. 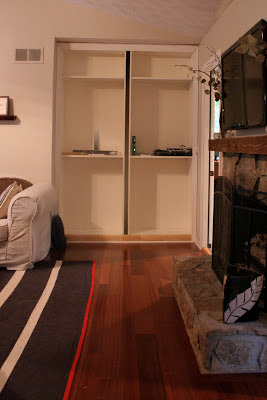 For the next year this little space was home to a ladder shelf and a random table that made me cringe each time I saw them (basically all day long). 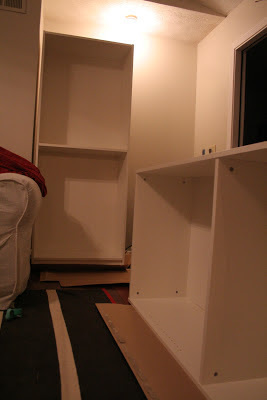 I finally put Pinterest to work and found this blog post from Centsational Girl with her fantastic solution: turn Ikea's "Billy" bookcases into a built-in for a fraction of the cost. Within a few days, we were DIYing by candlelight again. Evening 1: Assemble Billys and push into place. Day 2: Return to Ikea and purchase the height extension units we thought we needed, but weren't entirely sure about. Bonus: Sweet B and I got to share an Ikea cinnamon bun for our trouble. 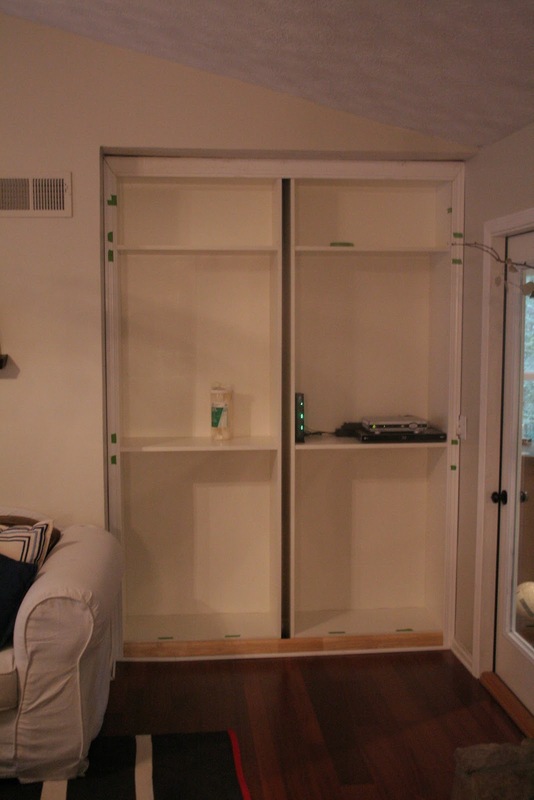 Day 3: Invite in-laws over for "football" and enlist their help cutting trim to size and pulling assorted cables through. Day 4: Nail trim pieces into place, make trip to Home Depot to buy supplies like extra trim, can lights, caulk and Frog tape. Day 8: Invite father-in-law over again to wire the nook with small can lights. :) 2nd trip to Home Depot for supplies. Day 9: Decide to paint the backs of the shelves a mustardy gold color...3rd trip to Home Depot to purchase sample pot of Torchlight by Sherwin Williams. Day 10: Ponder color choice. Day 12: Corral all our books into one location and start the never-ending process of arranging and re-arranging. 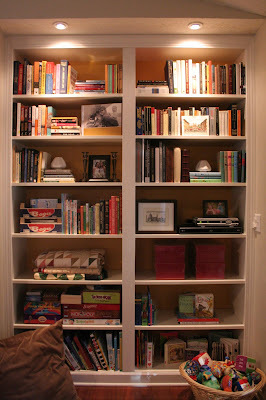 I love how the bookcase helps draw your eye up and emphasizes the height of this room. 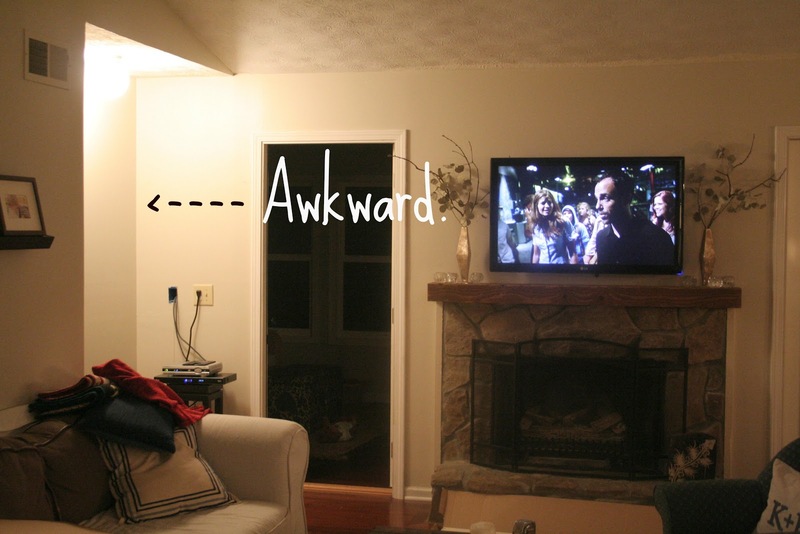 It also balances out the hallway opening on the left side of the room. A place at last for my collection of classic novels! 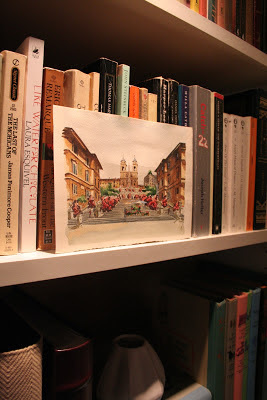 The painting is a memento from our honeymoon in Italy. My mom lent me her collection of classic reads, the "Junior Deluxe" Editions...I have loved the look of these books since I was a little girl. We store our limited DVD collection in some clementine crates from last winter. I love the color and style of these crates. And they were...FREE! My favorite. 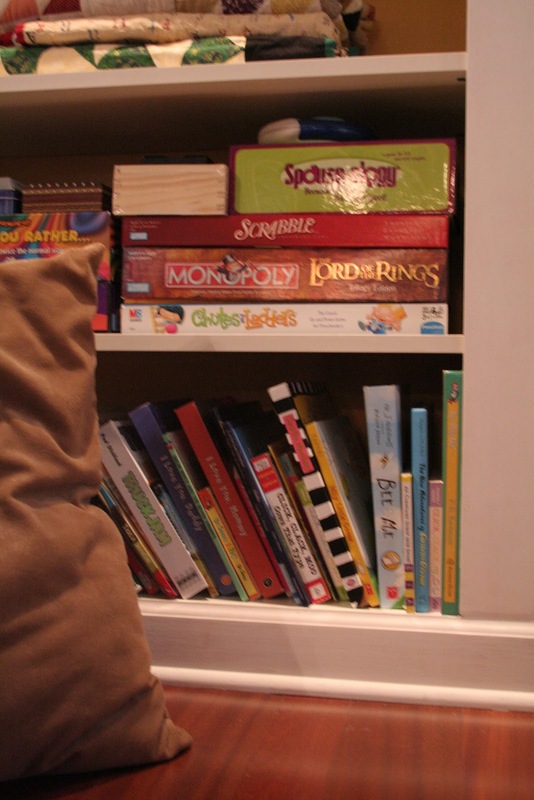 And since this is a highly functional bookcase, the bottom two shelves are filled with children's books, board games and toys. 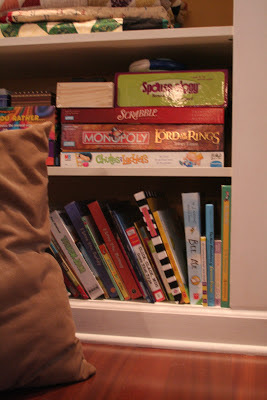 I absolutely LOVE having all the kids' books in one spot and it helps remind us that this family room should be used for reading and playing games at least as much as it is used for watching TV. 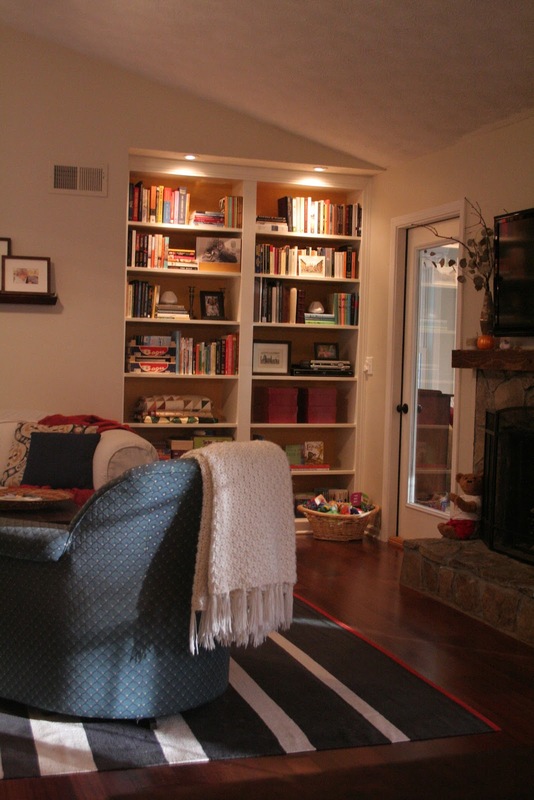 We spent under $200 total on this project - and I think the impact it has in the room makes it one of our biggest "bang for your buck" projects to date. What a wonderful project!! I love the lighting and the yellow paint! 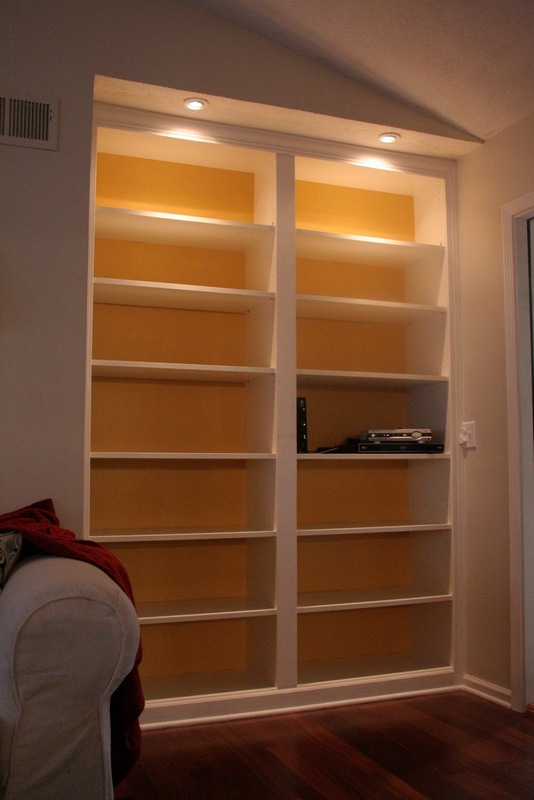 we are right in the middle of doing a similar project...it's nice to see one finished. You did such a great job! Thank you! Hope to see pics up on your blog whenever you finish it!